Flicker in LED lighting occurs as a result of modulating the current to electric light sources. Many of our competitors’ LED products on the market today continue to introduce high flicker rates into indoor environments. Even though the human visual threshold is about 50Hz, if a light source is flickering faster than 50 times per second, this substropic flicker can still have a negative impact on health, wellness, and productivity. That’s why Energy Focus has launched a marketing campaign that makes reducing flicker a top priority. In order to make sure our LED products offer the most extensive health and wellness benefits over conventional lighting, we make sure to remove flicker in all of our products. Energy Focus has the first flicker-free LED tubes on the U.S. market. We’re challenging our competitors to meet the same standards we are, by making the reduction in flicker a top priority for their products, too. Because with flicker, what you can’t see CAN, in fact, hurt you. 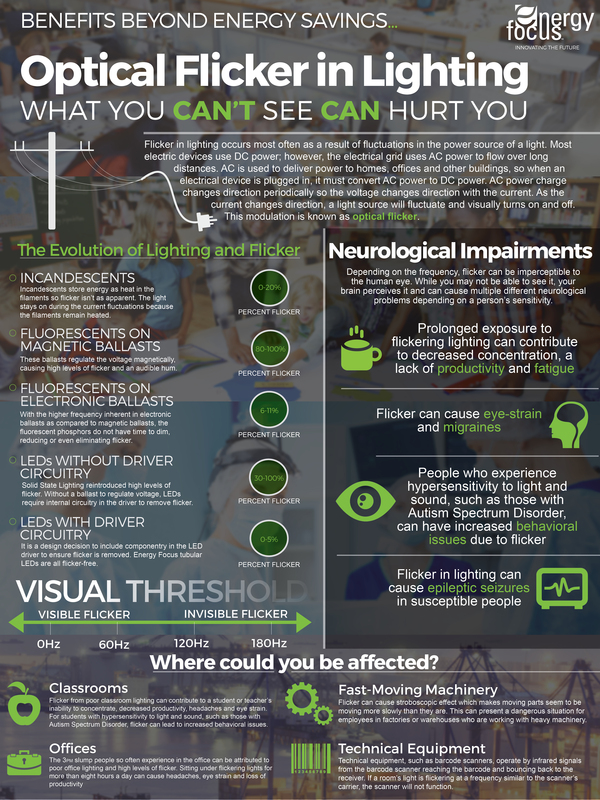 For more information about Flicker, download our whitepaper or contact us for more information.